Author Erica Bauermeister Wrote Her First Novel When The Characters Talked To Her. Don't Laugh, Writers. You've Been There! You are here: Home / Erica Bauermeister / Author Erica Bauermeister Wrote Her First Novel When The Characters Talked To Her. Don't Laugh, Writers. You've Been There! Sit down and hold onto your keyboards for this one! Erica Bauermeister’s novel, JOY FOR BEGINNERS, has SEVEN pivotal characters. Ok, you can breathe again. This is a intricately woven tale of thwarting fears and taking chances — and how seven women, separately as much as together, agree to take on a challenge. For me it was a beautifully written, evocative and enjoyable book — because it’s always fun to see other “people” doing things I don’t! Please welcome Erica Bauermeister to Women’s Fiction Writers! Author Erica Bauermeister Wrote Her First Novel When The Characters Talked To Her. Don’t Laugh, Writers. You’ve Been There! Amy: In JOY FOR BEGINNERS, which was recently released in paperback with this gorgeous cover, you share the story of a group of women each facing a challenge set upon them by the others. What fascinated me was how this novel was both their collective and their individual stories. Why did you decide to write it that way — and how did you set out to face your own challenges of telling separate stories that were also one? Erica: JOY FOR BEGINNERS is almost more interconnected short stories than it is a novel. This type of novel has fascinated me for a long time — I love the feeling of digging deep into individual characters and seeing the connections between them. To me, interconnected short stories are a great deal like life; we get these brief, intimate insights into other people’s lives, like opening the windows of an Advent calendar, but we can never really see the whole person. I wanted to create a book that took those brief glimpses and made a coherent, artistic whole. Amy: How did you get the idea for JOY? And, do you find that once you have an idea for a novel it sticks, or does it evolve with time? Erica: Seven years ago, I was talked into rafting down the Grand Canyon. One of the great things about being a writer is that all the scary/embarrassing/frustrating/humiliating experiences in your life are grist for the writing mill. Even as you are plowing through a rapid that is dumping thousands of pounds of water on your head, you find yourself thinking “I’m so going to use this someday.” I didn’t know how I would use it for several years. But as a generally scared person, the idea of fear is a fascinating one to me, as was the opportunity to think about what scares different people. I wanted to look at a variety of fears, the ones that are so intertwined into us that they have become invisible, as well as the big, obvious, adrenaline-producing ones. Having seven very different female characters gave me the chance to examine fear in many different kinds of light, and my understanding of both fear and friendship deepened a great deal during the process. Amy: Do you have a writing schedule or writing rituals that help you achieve your goal of “finished novel”? Erica: I wish I had a schedule, but alas, no. I could blame my poor habits on all those years of being a mother, but the reality is that I’m just not wired to write at a consistent time. I grab moments when I can, and when inspiration hits. As I write books that are largely character-driven, this works out well for me – there are many times when my character needs to come to a realization and I honestly don’t yet know what it is. For me, it works best to take a break and let the idea come to me rather than chasing it down. But when it does come, I can write for hours and hours. One of the things that helps give me structure in this rather free-form approach to writing is my writing group. There’s nothing more motivating than knowing there are three other writers waiting for your pages. And their critiques are energizing – I always leave feeling inspired about how to make my work better. Amy: JOY FOR BEGINNERS is your second novel (though not your second book), THE SCHOOL OF ESSENTIAL INGREDIENTS being the first. Are you working on another novel now and is there anything you can share with us about it, or your process for writing it? Erica: I’m just finishing my third novel, THE LOST ART OF MIXING, which should be coming out late January 2013. It picks up four of the characters from THE SCHOOL OF ESSENTIAL INGREDIENTS and adds another four into the mix (as it were). It’s structured around four pairs of characters, each pair in midst of a misunderstanding, and takes you into each of their viewpoints. It was an exciting challenge to dive deep into characters who could be in direct opposition to each other, but in the end, I found myself falling in love with each of them. In these days of divisiveness I think that’s an important mental exercise. Amy: How would you define women’s fiction — and do you have an issue labeling your books as such (or maybe you don’t!). Erica: I think both writers and readers would be well-served if we got rid of literary categories that are based on gender. No matter how we recast and redefine and empower those labels, they will always be limiting. They encourage stereotypes, when I think the whole point of literature is to open our minds to new ways of seeing. On the other hand, I understand the need for a short-hand language to help us sort through the hundreds of thousands of books that we have to choose from – I’d just opt for categories that are based on the books themselves, rather than the gender of the writer or reader. Why not focus on the author’s choice of focus (character-oriented versus plot-driven) or the style of the book (lyrical/direct/conversational, etc) or the point of view of the narrator (first person/multiple points of views/omniscient, etc)? None of those categories are dictated by the gender of the writer or reader and I bet that they would be far more helpful in helping us find books we will love. Amy: What’s your best advice specifically for aspiring authors — and soon to be published authors — of women’s fiction? Erica: When I was 43, I made one of the best decisions in my life. I had been writing for hire; the pay was almost nothing and the work was uninspiring. At the same time I was renovating our house, essentially for free. I realized that writing what other people wanted me to write was killing any talent I might have had, so I switched the equation. I became a real estate agent and made my living through my knowledge of houses, and wrote a book that I believed in, just for me. It was the book I liked to think about at two in the morning when I couldn’t sleep, the book whose characters came and talked to me. I loved that book and it loved me. Ironically, or not, that book (THE SCHOOL OF ESSENTIAL INGREDIENTS) was the one that sold and allowed me to quit real estate and write full time. So my advice would be — find the book you need to write, the one you love with your heart and soul. The one you can’t not write. Then write that. All the rest follows, one way or another. 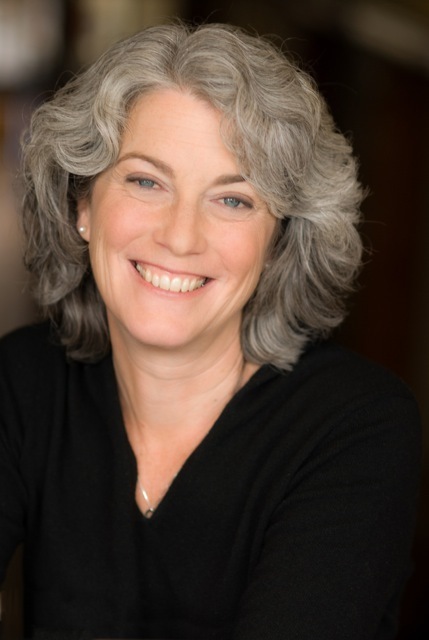 Erica Bauermeister is the best-selling author of two novels, THE SCHOOL OF ESSENTIAL INGREDIENTS and JOY FOR BEGINNERS, as well as a new novel, THE LOST ART OF MIXING, due out in winter 2013. She lives in Seattle and Port Townsend and spends a lot of time writing while riding on ferry boats. You can find out more about Erica and her books at: www.ericabauermeister.com, and you can “like” Erica on Facebook. « How Do You Choose The Books You Read? A Poll, Complete With A Prize, And "Air Quotes"
I know we shouldn’t judge a book by its cover, but that is one beautiful cover! Congratulations, Erica, and best of luck with work on your third novel… very inspiring. They do talk to us, don’t they? Which, when working on a rewrite of more than one at a time, can be very distracting. Wow. What a FABULOUS interview, Erica and Amy. I love the description of our experiences as “grist for the writing mill.” So true! I think that, as writers, knowing that we can use experiences as writing fodder makes the experiences, themselves, that much more memorable – or at least I think it makes us more present in the experiences themselves. Everyone should view life through the lens of a writer! It’s much more exciting that way. I also LOVED your response about the labeling of books. I would LOVE to see books labeled as you’ve stated. I’d be a big fan of the “character-oriented-lyrical” genre ;-). Thanks, Erica. I’m in trouble. Now I’ve got your books added to my TBR and a whole additional set. Thank you! Another great post, Amy. And Erica, your quote about the limiting nature of labeling by gender is spot-on. And you’re right – why limit literature in any way when it is, in the end, supposed to open minds? Love it. And can’t wait to read JOY. I’ve been advocating this for almost thirty years now, but I think the idea is starting to get some traction! Congratulations and continued success, Erica. Great interview, Amy. 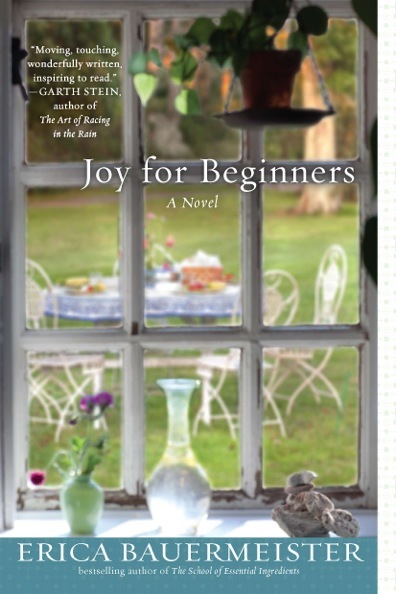 I can’t wait to read Joy For Beginners – I have it on my TBP (to be purchased) list for my next trip to the book store. I read a review of it last night and it immediately went on my list. . .and of course today I noted the release date for the new novel. I also wrote down the quote by Erica about her definition of women’s fiction – I couldn’t agree more. I know what you mean about verbally uninhibited characters! Bring them on. I love the cover of your book. What a bright and hooking image. I wrote my novel after a dream came to me- it was like I knew the story the entire time!